John Phillips is an internationally recognized photographer for the Black Star Photo Agency (www.blackstar.com) who has snapped thousands of photographs for numerous publications, including Arizona State University's award winning Research Magazine. In fact, if you pick up any edition of ASU's Research Magazine published within the past 15+ years, you'll find John's remarkable handiwork. (As a side note, John's also an accomplished folk musician; you can learn more about his musical talents at www.phillipstunes.com). Vertical, horizontal, or square. Choose your orientation beforehand and then compose your shot according to the following tips. Rule of thirds. Place strong horizontal or verticals along lines bisecting a third of the frame. Put important subject matter, like people's faces, at or near the intersection of these lines, as shown in this sample image originally shot for Newsweek magazine. Leading lines and patterns. Occasionally use objects like fences, sidewalks, and so forth to create lines leading into your photo. Also, look for and use repeating patterns in your subject. For example, the sample image uses the pillars to lead viewers back into the shot. Foreground and background. If possible, consciously have a foreground and a background in your shot. Use depth of field. Depth of field is a term for how much of your photo, from front to back, is in focus. Portraits of people usually have a shallow depth of field. The subject is in focus and the background is out of focus. The portrait mode on many digital cameras will automatically create this effect for you. Wide angle lenses in bright light will give you a large depth of field. Most of the photo, from front to back, will be in focus. Dramatic light. Use strong light from either the right of left for dramatic effect. Also, look for interesting kinds of light, particularly one hour after sunrise and one hour before sunset. Strong shadows can also add drama to you photo. Closeups and viewpoints. Most of the time, getting closer to your subject will improve your photo. You can use Macro mode on many digital cameras for very close detail. Or, move around. Get higher or lower. A change in perspective can make a big difference. Vibrant or unusual color. Look for usually strong or vibrant color to add an element to your shot. A black-and-white photograph with strong elements can also have the same effect. Fill flash. Using the flash in brightly lit outdoor scenes with people will eliminate strong shadows on faces and improve your photos. Communicate. Your photo should quickly convey information about your Web site or the particular page it's on. 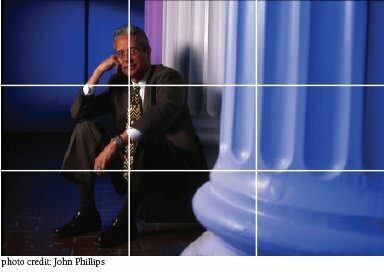 For example, the individual in the sample photo is the dean of architecture, planning, and landscape architecture at the University of Arizona, and the pillars help place him in context. Plus 1. Be there! You can only get a few good shots while sitting on your couch. Go out and be there!